The Slovenian national final is called EMA and in this festival the representative for the ESC will be chosen. By now it became a traditional Slovenian show, which is very popular all over the country. Due to the fact that Slovenia never won the ESC and Serbia did it 2007 the enthusiasm is quite high. The winner of this year is Eva Boto with the song “Verjamen” (I believe). It’s a power ballad with a strong and convincing melody. The song verse sounds quite spherical and mystic following older successful songs from Serbia like “Molitva” or “Lane Moje, or even some Celtic elements like in Irish songs. There will be also other strong ballads from Croatia and Serbia this year, hopefully Eva will benefit from the high votes as well. 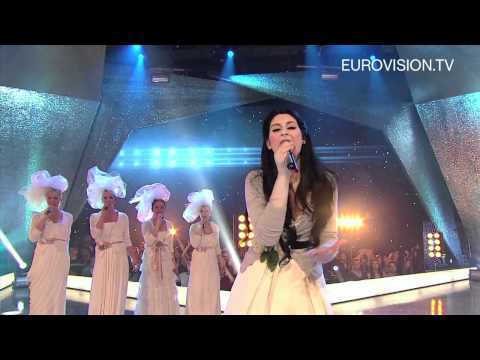 This song could really be the dark horse in Baku, a beautiful singer with a strong goose bumps song on a stunning stage could overwhelm the televoters from all over Europe, this is a hot favourite. Good luck! Slovenia can look back to a 27-years-old history of Yugoslavian entries, where one victory with “Rock me” by Riva in 1989 could be celebrated. The Slovenes have participated since then with great enthusiasm and put every effort in well chosen songs of high quality with an international standard. Slovenia is the only country from the ex-Yugoslav countries which does not benefit from the points of the neighbour countries like Croatia, Serbia and Bosnia & Herzegovina. Since the semi finals have been introduced, Slovenia could only qualify two times. The most popular songs from Slovenia are: “Prisluhni mi” by Darja Svaiger in 1995 (7th), “Energy” in 2001 (7th) and “Vanillja” by Maja Keuc in 2011 (13th).